Blogging Events Galore! | What Smells So Good? Okay, forgive me for trying to kill a few birds with one stone here, but I've been putting off so many blogging events that I've wanted to take part in that I have to shove them all into one entry. Today's featured events will be World Apple Day from kochtopf, In the Bag from RealEpicurean, and of course ARF / 5-A-Day from Sweetnicks. Tomorrow's post will be another bulk post for British Food Fortnight at Fuss Free Flavours, September Pets from Peanut Butter Étouffee, and Of Course You Can Pair Garlic With That! from Habeas Brulee. Ah, now that I've posted that there is NO excuse for me to forget! After all that I promise to do the write up for the wedding and take part in the meme that the wonderful Valli at More Than Burnt Toast tagged me for. Phew! Okay, first things first. A World Apple Day invitation was sent to me from kochtopf, and since I eat an apple (or two) every day, I figured it would be a great and easy way to kick-start the Fall season. 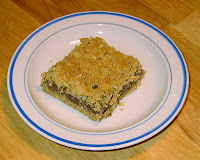 I'm not too sure where this recipe originated from (maybe a box of Bran Flakes?) 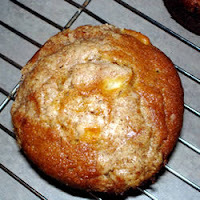 but I do know that it's simple, tasty and almost like a carrot cake with apple chunks in texture and taste! It's definitely a good go-to for breakfasts on the go, and it isn't too sweet, plus the fibre from the apples, bran flakes and carrots will do your system good! Even baked as jumbo muffins they are still low in fat and fairly low in calories so your waistline won't hate you either! In a bowl, combine the first six ingredients. In a small bowl, beat the yogurt and buttermilk. Stir into dry ingredients just until moistened. Fold in apple and carrots. Fill muffin cups coated with nonstick cooking spray three-fourths full. Bake at 400 degrees F for 20-23 minutes or until a toothpick comes out clean. Cool for 5 minutes before removing from pan to a wire rack. Serve warm or freeze for future use. For ARF / 5-A-Day, I present to you a recipe made with one of the strongest protein and antioxidant powerhouses there is: Black Beans! Eating these little gems helps to lower cholesterol and LDL levels, scavenge free radicals, moderate insulin resistance, and reduce cancer risk. Many people also find them easier to digest than other beans, and they are such a versatile ingredient that eating them will never leave you bored! 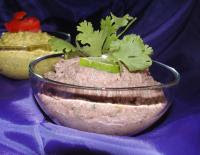 In fact, I've turned them into a yummy, flavourful and tres garlicky dip and spread that's great for parties or hogging all to yourself (if you're like me, hehe). Combine all of the ingredients into a food processor. Cover and refrigerate until ready to use (up to one week). Finally, for the In the Bag event, I rummaged throug h our pantry and came up with a recipe featuring a both a tasty, fruity orange flavour with great dried fruit I always associate with the cooler weather, dates! Combine oats, pastry flour, salt, 1 cup of the brown sugar, and baking soda. Mix in the butter until crumbly. Press half of the mixture into the bottom of a 9 inch square baking pan. In a small saucepan over medium heat, combine the dates, zest, orange juice, water, and brown sugar. Bring to a boil, and cook until thickened (about 15 minutes). Stir in lemon juice, and remove from heat. Spread the filling over the base, and pat the remaining crumb mixture on top. Bake for 20 to 25 minutes in preheated oven, or until top is lightly toasted. Okay! I think that's all for today! Have a great beginning of the week everyone! Everything sounds so delicious Sarah. The first event I had not heard of, so, I will have to check it out. Keep up the great posts!!!! I love the muffins but also the rest of your entry! Thank you in participating!